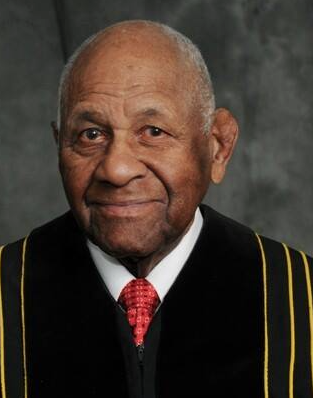 Dr. Richard H. Dixon, Jr., minister, civil rights leader, and community leader, passed away on Saturday morning, April 25. He was born October 3, 1923 to the late Beulah and Rev. Richard H. Dixon, Jr. The only son of three children. Rev. Dixon was Pastor Emeritus of the Macedonia Baptist Church. He served forty-one years as Pastor of this great Church, and on December 31, 1999 retired as its Pastor. He attended Public Schools in Dallas, Texas and Fort Wayne, Indiana. He received a B.A. Degree from Bishop College, Marshall, Texas; Bachelor of Theology Degree from the American Theological Seminary, Nashville, Tenn.; Bachelor Degree of Divinity from Colgate Seminary, Rochester, New York; D.D. Degree from the University of Detroit, Detroit, Michigan; Candidate for Doctorate Degree from Princeton Theological Seminary, Princeton, NJ. Rev. 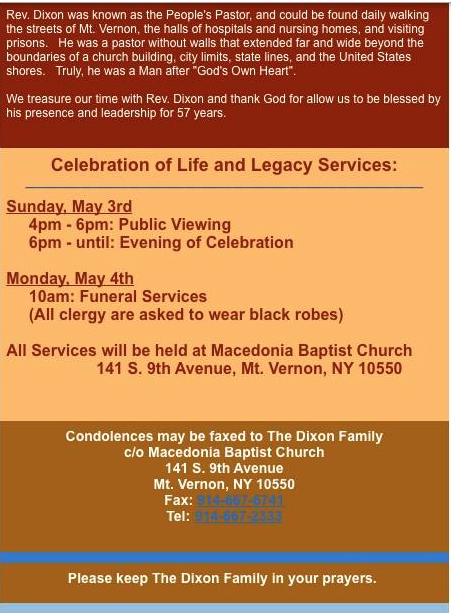 Dixon was pastor of three churches, First Baptist Church, Lackawanna New York for four years; Historical Trinity Baptist Church, Pontiac, Michigan for ten years; and Macedonia Baptist Church, Mount Vernon, New York for forty-one years. He was called to preach and was licensed in Kansas City Missouri, in the year 1946. He served as President of the Mount Vernon Council of Churches; Westchester Urban League; founder and past president of the United Black Clergy of Mount Vernon; founder and past president of the Westchester Christian Leadership Conference. He had the honor of being selected, with 25 outstanding people throughout the United States, to be a part of the group to accompany Dr. Martin Luther King to Oslo, Norway to receive the Nobel Peace Prize. IN the addition, the People’s Republic of China invited him, with 17 other educators and religious leaders, as a guest of the Chinese government to tour, study and exchange views (the summer of 1980). For several years, he was assigned as Second Deputy Commissioner of the City of Mount Vernon, and head of the Chaplaincy program of Mount Vernon Police Department. He was once honored to provide opening prayer at the United States Congress in Washington, D. C. He also served as Chaplain for the New York State Senate and Assembly. He has also received countless awards and honors. Reverend Dixon was married to the former Earnestene Wright. They had three children; Richard III, Sonya and Lori; two sons-in-law, Mark Stephens and George McClendon; two granddaughters, Styler and Kayla and three grandsons, James, Dabnus and George, Jr. He also had a son Carl and grandson, Cameron.